I DID IT I DID IT! I finally was able to make a card, a SUNFLOWER CARD! I used The Expression, Plantin Schoolbook, Stretch Your Imagination and Jasmine for this card. The .cut file is set to cut 6 at a time but you can delete what you want if you don't want to make 6 of them. The flower and center will cut in half for you. I found this paper at the LSS and fell in love with it and have been dying to try it out. It is from PineCone Press. The flower print and yellow/orange are double sided. The green is just one side. Of course I had to use mounting foam to add some dimension. I so love dimension!! And yogurt. I really do love yogurt! Okay I had to post this since I was so excited about actually making something after such a long hiatus but now I must go to bed! I got a lot to do tomorrow and I am sure I will run out of time before people start showing up at my house!! Nice card Okie, tfs...glad you're able to scrap again! Glad that you are back... love this card...so bright and happy. SEEEEEE...We told you so!!!! It is a wonderful and cheery card!!! LUV IT! Your an awesome artist! Your card is so cute. I love it. 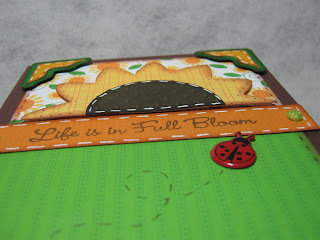 okie i do love this sunflower card, well done. you are on the right track. keep it up. Beautiful job Okie!! So glad you are back!!! Awesome card Okie, glad to see you are back. yay you! 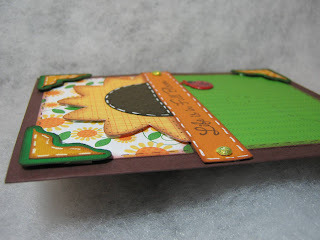 i am so glad you were able to make a card and a fabulous one at that! 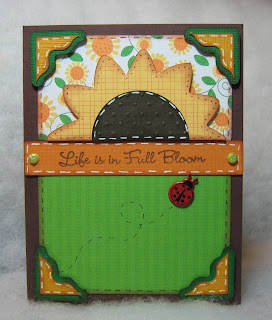 i just LOVE sunflowers and this card is awesome! You did a great job. Glad your back. Love it!!! I'm so glad your back to crafting again!!! I've missed seeing your creations and reading your posts!!!!! I hope you have a great weekend!!!! Super cute! A great card. Thanks for the file. Yay! I was so nervous this morning when I couldn't get into your blog! So glad to see you crafting again, love the doodles! This is so darn cute! I LOVE IT! I am so glad you are back to crafting and making cards! Now, when are you coming down to organize me? I can't seem to download any of your cut files. I keep getting a message stating "Sorry the file you requested is not available". Any suggestions on what I might be doing wrong? I love your stuff, by the way! You are soooo creative! Thank you so much for this Freebie. I want to let you know that I posted a link to your blog in Creative Busy Hands Scrapbook Freebies Search List, under the Elements post on Jun. 27, 2009. Thanks again. Glad your back, I was a little worried there. I tried to get on you blog and couldn't. I have been following your blog for a while and just love it. Thank you for sharing you beautiful card and I'm glad your getting back into crafting.